Relax and play on the award-winning beach for less this summer and fall. PROVIDENCIALES, TURKS & CAICOS – TripAdvisor's Travelers' Choice Awards, which identifies the world's top properties and beaches, has named the stunning Grace Bay Beach, where Ocean Club Resorts is set, as the number one beach in the Caribbean and in the world. 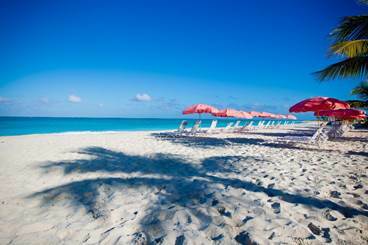 The beach is first in both the "Top 25 Beaches in the Caribbean" and "Top 25 Beaches in the World" lists. TripAdvisor's Travelers' Choice winners are based on millions of valuable reviews and opinions from discerning travelers all around the world. Ocean Club Resorts is comprised of two all-suite properties, Ocean Club and Ocean Club West, located just one mile apart on Grace Bay Beach. The beach consists of 12 miles of powdery white sand and crystal clear, turquoise waters, with average water temperature ranging from 79 - 84 degrees Fahrenheit year-round. The award-winning beach offers Ocean Club Resorts' guests the ideal tranquil environment to lounge in total relaxation under one of the resort's signature pink umbrellas. Additionally, Ocean Club is located on the widest section of the pristine beach. "We are thrilled that both of our properties are located on the best beach in not only the Caribbean, but the world," said Ocean Club Resorts' CEO Tom Lewis. "It's an honor to be acknowledged by the trustworthy TripAdvisor community, and we are delighted that we can provide our guests with a front-row seat of the white sand, clear water and spectacular sunsets that Grace Bay Beach has to offer." And now, guests can take advantage of 20 percent off rates, starting at $192 per night after the discount, on all suites except three bedroom suites. This offer is valid for travel now – December 20, 2016 with a four-night minimum stay. Reservations must be booked directly on the website or through the U.S. reservations office by calling 1-800-457-8787 or emailing moc.stroserbulcnaeco@ser. For more information on Ocean Club Resorts or to book, visit www.oceanclubresorts.com.